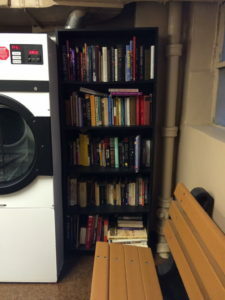 Tucked into the corner of the laundry room in my 13-story apartment building in New York City is a little free library. It was created fifteen years ago from a bookcase salvaged from a neighbor’s trash. Nearby sits a repurposed plastic container marked ‘Free Stuff’. The library provides a steady source of free quality reading material to my neighbors and me. The Free Stuff Box serves as a convenient way to pass along gently-worn household goods for both neighbors and building staff to use. Examples of the ‘sharing economy‘ at a hyperlocal scale, the library and ‘Free Stuff’ box are especially free, low-tech amenities that are easy to implement in densely populated cities. They can help city dwellers save money, prevent waste from winding up in the trash, build a sense of community — and importantly, help to change consumption culture. As the artifacts in New York City’s unofficial ‘trash museum‘ pictured above, so poignantly signify, much household waste is composed of highly durable and still usable items like furniture, clothing, toys, and household articles. So it is important that we consider ways to keep such items circulating within our local economies, starting with our own buildings and neighborhoods. Residents in cities all around the world are now exploring fresh new ideas beyond traditional white elephant sales and thrift shops to share hyperlocally. The possibilities are endless. Want to start to share with your neighbors and friends? It’s easy. Here’s how. 1. Host a clothing, housewares, or toy swap. Take advantage of public services such as Stop n Swaps, free public community reuse events run by GrowNYC, or help start them in your own city. Or, create a new social occasion among friends and neighbors. 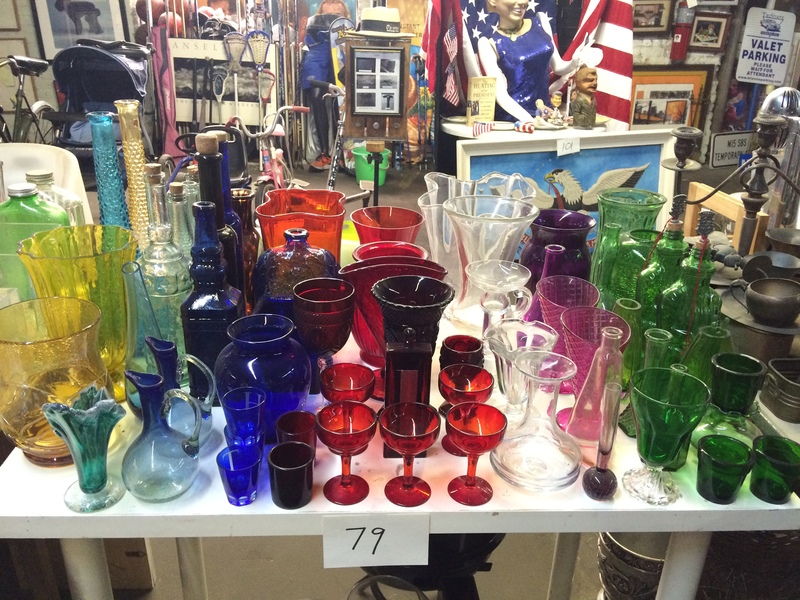 Inspiration: One Upper West Side NYC building hosts a Swap event in their lobby every Spring. 2. Give items away on FreeCycle.org. Sign up for NextDoor.com — a website that allows neighbors to borrow items from each other. Consult the DonateNYC page or a similar resource in own city to find folks who want your stuff. 3. Encourage your local library to lend more than just books and CD’s. Sacramento’s Library of Things lets residents borrow sewing machines, musical instruments, and board games. To complement resume-writing classes, four branches of the Queens Public Library now lends neckties to job seekers. Encourage more local tool libraries like the South Street Seaport Tool Library. Toronto’s Sharing Depot started out sharing power tools and now offers a whole range of things to share for an amazing $50/ year. 4. Declare Sunday evenings as ‘clear out the fridge night.’ Invite neighbors and friends to pool leftovers. Set up a community refrigerator and little free pantry to share food with neighbors and co-workers. 5. Repurpose a cardboard shipping carton into a ‘Free Stuff’ box. Drop in a few items, place the box in your own lobby, workplace breakroom, or other public space — and watch the sharing begin! 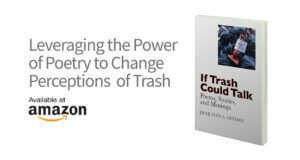 It might seem strange that our waste can be a source of connection and a way to foster economic resilience. But with the potential benefits we all can enjoy, it makes sense to try. All it takes is a neighbor or two willing to get the ball rolling. Will it be you? Get inspired to share a lot more with neighbors with our new, interactive SHARE, SWAP, BORROW page. Focused on our hometown here in New York City, it can inspire city dwellers everywhere with ideas to share, swap, borrow, donate and gift your way to cutting down on the waste and clutter, saving money and making new social connections. It’s an important step in changing consumption culture — and living better. Tell Us: What Do You Share? I love this concept of using sharing to change consumption culture and the idea of a sharing economy. In recent years we’ve seen the beginning stages of a shift where people aren’t as obsessed with the idea of owning their own cars and other items that they don’t use regularly and instead are using sharing services. We see examples of this in the rising popularity of ride sharing apps and services and these mark opportunities for further growth. In college we had various forms of “free boxes” in most if not all of the common spaces and a Free & For Sale page on Facebook. I was surprised that there weren’t even more “free boxes” in shared/ communal spaces in NYC outside of residential buildings. This could be because common spaces in the city operate somewhat differently from the ones on college campuses. I am glad though to see that there are so many sharing and swapping opportunities in NYC. All of these options are simple and easy to adopt into our everyday lives and most of all build community, something we can never get enough of! Didn’t realize that college campuses were so ‘Free stuff’ friendly these days, Ashley. Excites me to think that recent grads will bring their ‘free Stuff’ habits with them into their homes/ apartments, offices and other public spaces. Please – don’t hold back. Recommend this idea to your bosses and super/ landlord! I absolutely loved reading this article and the concept of hyperlocal sharing. This is a notion that is extremely simple and can be embraced all around the world. All it takes is merely receiving a box, and placing it in your lobby. But, in order to begin this, it takes individuals taking the initiative and endorsing it in their society. Most people are likely uninformed that communities such as these exist in their city. Not only is this altering the consumption culture, but it is economical as well. All it takes is one person deciding to take the initiative and encourage sharing within their community. The idea of sharing embodies sustainability as a whole. We are encouraged to build stronger communities through our ties with one another, while also creating safer and more sustainable environments. The process by which students share notes in my college dorm, has become something of an environmental campaign. In exchange for helping students with extra, unneeded notes, you can earn more “dorm points,” which is often free foods, drinks, or movies. So, by getting rid of some extra paper and giving another student some extra guidance, you can enhance your own sustainability and help a friend. The idea of sharing is what continues to help students in the strive toward becoming sustainable. I think sharing not only helps empowers us as individuals, but also betters the world in which we live. This is a great article and an interesting concept that I never would have thought about when trying to reduce waste. Instead of throwing away items that do not hold value to someone, if people were to, for example, leave these items on their curb for others to take for free more often, goods can be recycled throughout a community and our impacts on the environment can be reduced. This is something that is easy and effortless, and is also a good thing to do! Giving back to the community can help reduce waste, while doing right by your peers and building relationships at the same time. 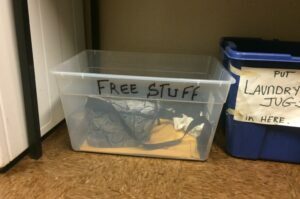 The introduction of the “Free Stuff” box into the online sphere is such a revolution to individuals that feel guilt about getting rid of maybe-too-specific items because you simply cant find someone to take them. Where I grew up we had a “Buy Nothing” facebook page to connect people in the community and create an online “Free Stuff” box. After moving recently, I found myself with an extra 20-30 closet hangers – I made a post on the free section of Craigslist and they were gone within twelve hours. Its great to know that its now so easy to connect yourself with people who need the exact things you’re trying to get rid of. I love how this article really emphasizes the need to change our consumption culture. A lot of the time I wonder why we all feel the need to collect so much stuff. Even though I actively try to fight my consumerist urges, sometimes I still find myself desiring the validation material goods gives me. I wonder if hyperlocal sharing can help shift the validation that most people get from buying material goods to instead getting validation from the sense of community hyperlocal sharing allows for. Personally, I really want to start a hyperlocal book sharing program on my campus. As college students every single semester we need to purchase new books for a new set of classes. They can be extremely expensive and difficult to track down. I think it would be great if people on my campus could participate in a program where they could bring their old textbooks and swap them with other people. It would be a great way to start a community, save money, and reduce the amount of waste buying textbooks creates. Let me know if anyone thinks that this could be a good idea! I love the idea of one person’s trash being another’s treasure. We did an activity in my economics class where each of us brought ten items in that we thought to be trash, and tried to exchange these items for things that we wanted from others. A boring old mug I had at my house ended up being so much more valuable than I thought–I was able to exchange it for three things that I wanted. I’m so glad to see this idea emerging and I would love to see it becoming more mainstream in different communities. Specialized libraries could be made for all sorts of different items, and could be visited like a shop for a specific kids of goods! Loved the idea of ¨Hyper local¨, as Ashley mentioned at school, since we are all students we are always willing to get things for free, and the community is real and engaged. Since NYC was so many colleges, it would be nice to find a way to communicate with our neighbors, that are not students, that their trash can definitely be our treasure!!! As I always say, most of the time the technology is already in place, (in this case it can be as simple as cardboard and a box) but we need to work on the incentives and with people´s behavior which is the more complicated part of it. Loved the idea of ¨Hyper local¨. As Ashley mentioned, at school we are always willing to get things for free, and the community is real and engaged. Since NYC was so many colleges, it would be nice to find a way to communicate with our neighbors, that are not students, that their trash can definitely be our treasure!!! As I always say, most of the time the technology is already in place, (in this case it can be as simple as cardboard and a box) but we need to work on the incentives and with people´s behavior which is the more complicated part of it.